Edit Note Oct. 31, 2018. It is now second tallest. Tallest now is the Statue of Unity in Gujarat, India. 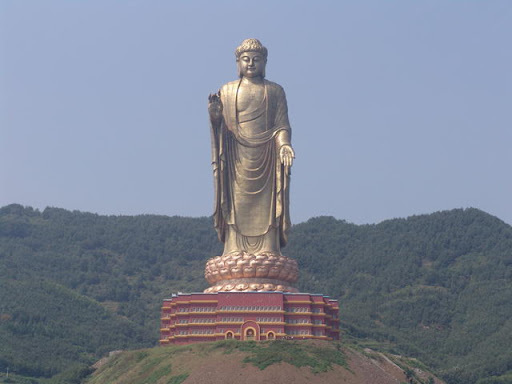 'Spring Temple Buddha' in Zhaocun, Lushan County, Henan, China is World's tallest statue, as well as World's tallest Buddha. It derives its name from nearby hot spring, which is renowned for its curative properties. 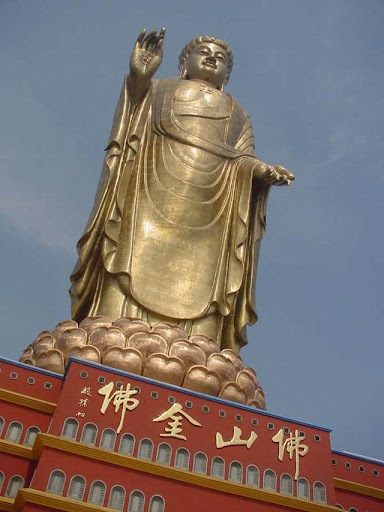 Completed in 2002, initially the height of statue including its lotus throne was 128 metres. The 25 metres high pedestal on which the statue is placed gave it a total height of 153 metres. In October 2008 work was started on reshaping the hill on which the statute stands and two further pedestals are being constructed which will give the monument a total height of 208 metres. Compared to this the total height of Statue of Liberty including its pedestal is only 93 metres.